If you’re here, you’re probably already sold on the idea of bike travel! Lots of people are trading their backpacks for wheels as they too discover there’s no better way to see and interact with the world. There is no need to make the same mistakes as me. This book has been curated through hundreds of conversations, emails and messages over the years from people like you who are on the precipice of an adventure, ready to see the world in a different way. 27 subject areas are waiting, with information spanning from trip planning and preparation, right through to all of the things you need to know while you’re on the road. It is a complete guide that can remove much of the doubt that people have before they tour. GET BICYCLE TOURING IN ONE HOUR FOR HALF PRICE!! 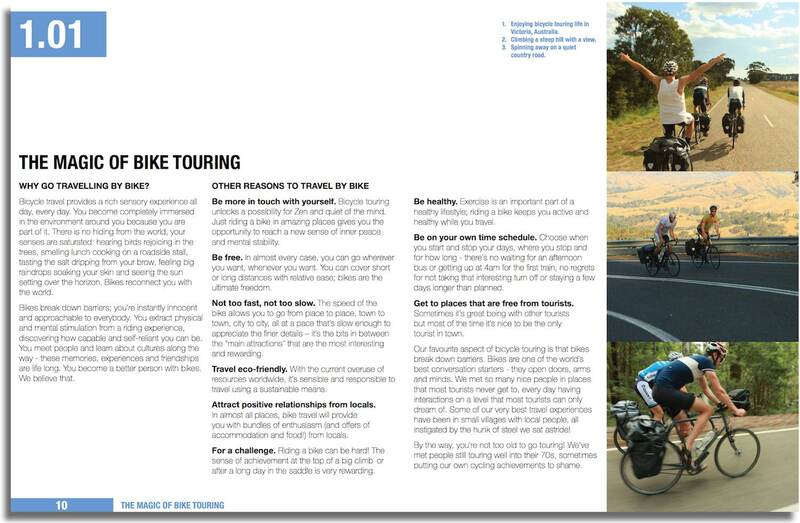 I offer 50% OFF this book when you get The 2019 Touring Bicycle Buyer’s Guide. My buyer’s guide is updated yearly with the latest models and is the easiest way to learn about touring bikes! You can find out more about what’s inside on THIS page. WHO IS THIS BOOK BEST SUITED TO? The less you know about bike touring, the more this book will help you! It’s been written in simple terms, in a logical order so that even people with zero cycling experience will understand. If you’ve completed a few tours before, this book will still help you. All the time I get wonderful ideas from books, blogs and other bicycle travellers about how I can make my own trips better. Everyone has a slightly different approach. WHY IS THIS BOOK A GREAT WAY TO LEARN ABOUT BIKE TOURING? While many books attempt to tell you everything about a topic, I understand that it’s easy to get overwhelmed by huge volumes of information. My approach is to arm you with the basic framework so that you can fill in the gaps! Matt Keenen recommended the book while commentating live on television for the 2015 Giro d’Italia. He notes that the book “gives you all the tips on adventure riding and how to make the most of seeing the countryside whilst on the back of a bike”.